First Lady Carla Markell inspired more than 120 people Saturday when she shared her personal story of how she overcame a childhood with alcoholic parents to become an educated, self-empowered woman committed to empowering others. Her presentation on “Self-Empowerment” took place at Cape Henlopen High School in Lewes and was part of Beebe Healthcare’s Rock your Life seminar series in celebration of Beebe Healthcare’s 100th anniversary. Mrs. Markell, describing herself as someone with an innate strength, said she had a vision of how she wanted her life to be and so aligned herself with people, places and things that reflected her values and goals. She made friends with good students who treated her the way she wanted to be treated. She said that she also avoided people and family members who used drugs, and instead made good decisions, eventually going to college. Though she went to the same elementary school as Governor Jack Markell, they got to know each when she was working at Friendly’s, a business she described as highly regarded for a teenager who needed to work. When she and Governor Markell started dating, she said he was the first person who asked her questions about her aspirations and goals. Years later, after they married and had two children, Mrs. Markell again found she was facing a new challenge when her husband wanted to run for Governor. She was afraid to be in the public eye, and she was afraid that people would find out about her addicted family. Mrs. Markell is a champion of volunteerism, and also encourages people to help others through mentoring, if they have the time to do so. She, herself, has mentored two boys from elementary school through college, and is still mentoring them. During the question-and-answer period, Mrs. Markell encouraged those who are in the school system to support at-risk students by telling them about Al Anon, as well as about other support groups. Responding to a question from the audience, Mrs. Markell said that following her experience at Al Anon, her mother stopped drinking and has been sober for 38 years. There are two more Rock Your Life seminars planned for Beebe’s 100th anniversary celebration. The events are free but registration is required. For more information or to register, visit the website www.BeebeHCE.org. Information also can be found by calling (302) 644-2900. Saturday, July 23: Adopt a Healthy Lifestyle! Keynote Speaker: Dr. Ben Brown, Medical Director of the Ornish Reversal Program. The event will take place from 9 a.m. to 12:50 p.m. at Delaware Technical Community College in Georgetown. 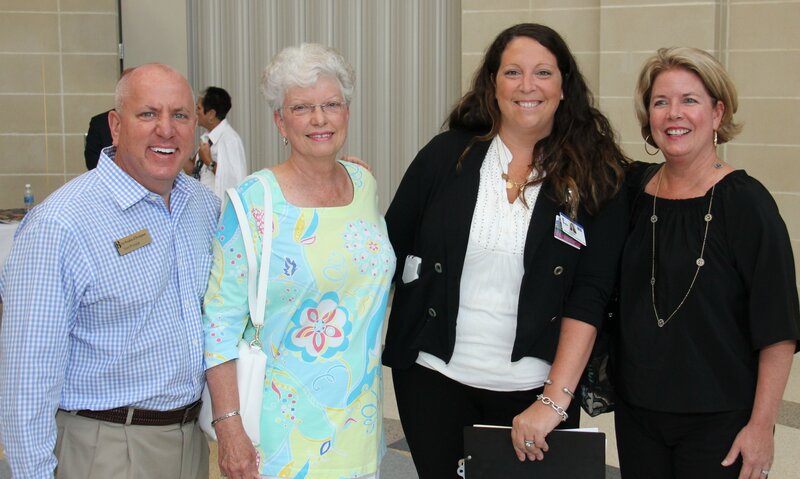 Pictured here, left to right, Tom Protack, Director of Development for Beebe Medical Foundation; Jan McCarty, a member of the Beebe Healthcare Board of Directors; Leanne Prosser, Coordinator of Beebe’s 100th anniversary celebration; and Delaware First Lady Carla Markell.